An original fireplace, alight with burning coals or logs on a cold winter night, is the ultimate period feature. Period homes are often renowned for being cold and difficult to heat, but a fireplace creates the ultimate cosy and comforting atmosphere. Fireplaces come in many forms, ranging from the large inglenooks found in early homes, to the cast-iron, marble and wooden surrounds of the Georgian and Victorian eras. Many fireplaces were boarded up in the 1960s and replaced with electric fires, but fashions come and go and now the heart-warming cheer of an open fire is aspirational again. So, if you are looking to uncover a previously boarded up fireplace, or simply want to include this gorgeous period feature in your home, check out our selection of the best traditional fireplace design ideas. Find out more about how to design a living room in our guide, and see more traditional living room design ideas in our gallery. When choosing a fireplace for your home, pick out a design that's authentic to your property's period. It might be that neighbouring houses have original designs that you can take inspiration from, or you can consult with an established company experienced in providing traditional pieces. Just as important as picking the right fireplace style is to ensure the design you choose is of the proper proportions. In other words, its size should flatter the room's size: too small and it will look out of place; too large and it will overwhelm the space. Paul Chesney, managing director of Chesneys, advises, 'A fireplace is the focal point of the room and can be a conversation piece which people will gather around – choose carefully as the right design and style can make an ordinary room exceptional. Celebrate the original materials within your home. The rich red of the bricks of this fireplace are brought to life by the tartan armchair and ruby shade of the Persian rug. Opting for neutral, light coloured walls helps showcase the exposed brick, while a picture rather than a complete mantlepiece, draws the eye, letting the original features speak for themselves. Keep exploring the timeless English style of this 18th century thatched cottage. There are no real hard and fast rules regarding the size, shape and proportion of a fireplace, as each room is unique, and can look and feel very different according to the prevailing light, paint colours and ceiling height. However, in general, avoid squeezing a generously proportioned fireplace into a small room and, equally, don’t place an average-to-small-sized fireplace in a grandly proportioned room. Here, a mantlepiece alone, painted to blend with the chimney breast, provides focus, without overwhelming a smaller room. If you're looking for the simplest of traditional fireplace design ideas, this is it. Victorian and Edwardian homes very often had marble surrounds. If your original fire surrounds have been removed, your first stop for an authentic original would be a specialist fireplace company or a salvage yard. Bear in mind that original marble fire surrounds bought in salvage yards are rarely in one piece. Instead, expect to have to assemble yours on site. This is no small task and it would be wise to get a professional involved. A fire surround bought like this would usually need professional cleaning, too. Try SalvoWeb for a salvage yard near you. No matter which style you opt for, fireplaces and chimneys require regular attention to work safely and efficiently and, even if they are never used, some routine maintenance will be inevitable. Check out our expert guide on how to clean and maintain a fireplace to help keep yours in check. By the second quarter of the 18th century, the fireplace had become the centrepiece of the main reception room, so if you're lucky enough to live in a home of this period, choose a fire surround that really draws attention to it. If you are happy to retain an original fireplace, but perhaps want to update the mantel and surround, it’s a good idea to take the opportunity to check that the structure of the chimney is still sound and safe. Contact HETAS to find a chimney sweep in your area. For good advice on choosing either a real or gas fire, visit a fireplace specialist, which can also advise on installation and recommend local gas fitters or electrical engineers that are appropriately qualified. Wood burning stoves are now a popular option fireplaces in homes of all periods, since the flame is contained within the body of the stove meaning that there is a lot less mess than with a traditional open fire. Stoves, like this Clearview 750 stove, offer great controllability and the crystal clear glass doors make the fire a spectacle to behold. Plus it produces five times more heat output than an open fire as well as being a more eco-friendly alternative to fossil fuels. Find out all you need to know about choosing a stove (woodburning or multi-fuel) in our guide, and check out all the best stoves on the market in our buyer's guide. Traditional fireplace design ideas aren't just about looking for the right surround – details, such as insert tiles, are important, too. 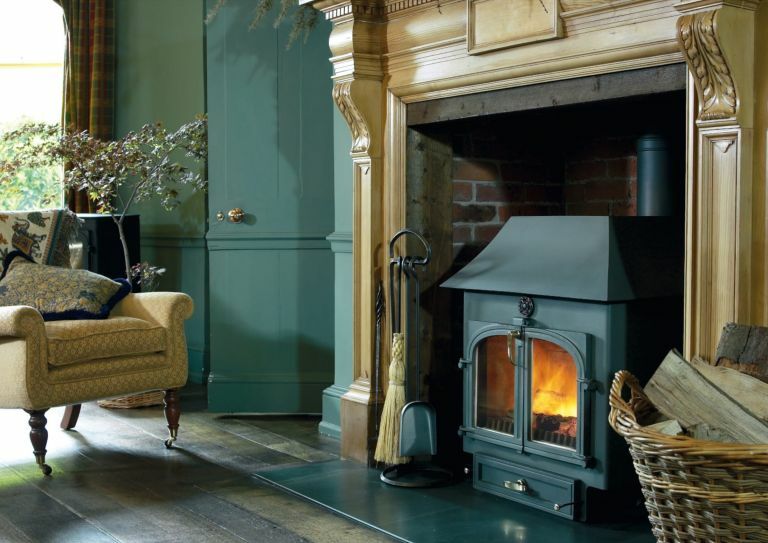 'If you are renovating a period home, and want to stay true to its heritage, it is more than likely you will want a fireplace to suit the decorative grandeur of your home’s history. There are a range of options available to you, including something like Stovax's classic Combination Range,' says Michael Coke, senior development engineer at Stovax. For more information on installing a tiled fireplace, check out our expert guide to tiling a fireplace here. If the fireplace you already have feels too large for the space, use visual tricks such as painting the chimney breast in a darker shade, or use a bold wallpaper to trick the eye and create a harmony between the fireplace and the wider wall. Be aware that the wallpaper trick used above looks wonderful but won't last in the long term since the heat of the stove will dry out the wallpaper paste, meaning it might need to be repapered once a year. Worthwhile? We think so. Looking for traditional fireplace design ideas that make it the focal feature of your living room? If your fireplace feels too small for your room consider adding a stand-out feature such as a fender, attractive fire guard or fire gate to further ‘extend’ the look of the hearth. It also adds an extra element of safety to the fireplace. Adding a detailed mantlepiece and mirror also draws attention to the fireplace, making it a focal point of the living room. Fireplaces can be a focal point without producing heat. Opting for decorative tiles, like these reproduction William Morris tiles, from Victorian Ceramics, in Henry Miller's renovated Victorian home create a sophisticated display. Complemented by painted detailing on the fire surround, and an ornate fire screen created by Henry's mother, the fireplace looks like a work of art in its own right. Perfect for this gallery-inspired home. See more of Henry Miller's fantastic design ideas in this real home story.